Times Tables Gloves is the unique way to help children learn their timetables. Available in all timetables from 1 to 10, each pair of gloves includes a timetable number on each finger and helps children actively count their timetables on their hands. The gloves also come in a range of four colours including blue, pink, red, and grey. The gloves were first created by a Primary Teacher and Tutor, to help school children learn their timetables through another method other than singing and repetition. After positive feedback from parents, Counting of Gloves (COGS) was created with the help of Learning With Confidence Ltd. 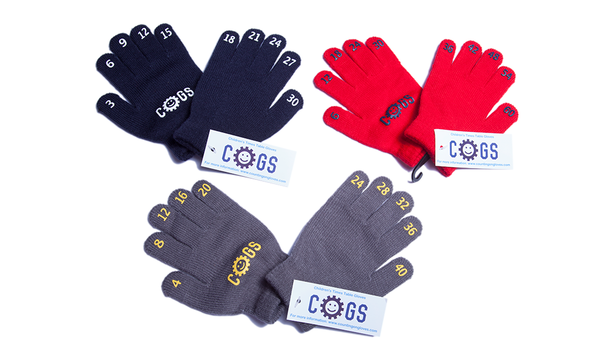 According to COGS, the benefits of the gloves include improvement of maths and cognitive skills, increase of a child’s all-round confidence, and improves relationships with parents/carers.